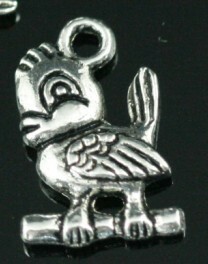 This is a cute little Bird on a Branch Charm. It is same great detail on both sides of the charm. It measures 5/8 in. x 1/2 in. wide x 1/8 in. thick and it a wonderful 3-D charm. This bird could be used on ATCs, greeting cards, scrapbook pages and other altered artwork. This is also a great charm for jewelry too. You will receive one charm for each quantity that you order.